Getting a perfect leather jacket is one of the best ways to look well put together. Often, men don’t understand that just one piece that hysterics well can bring together your whole appearance. Buying a leather jacket may be a huge investment in a wardrobe. So, you have to be careful while purchasing down a leather-based jacket while browsing online. Shopping something this is too cumbersome to your body could make your whole appearance collapse, even when you have portions that could look appropriate composed in the event that they healthy proper. When buying a jacket, understand that it must suitable round your shoulders the high-quality exceptionally else. Make certain that it isn’t too loose across the sleeves and strive to shop for one that buttons up without a lot attempt. 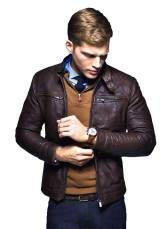 In regard to stitching and fitting of leather-based jackets, William jackets are trusted worldwide. We provide our best quality jackets that suit and fits your personality. With the experience of many years and cluster of customers, William Jackets becomes a unique and trusted jacket brand. William jackets introduce theStar Trek movie series-based leather jackets. Scott Bakula Captain Archer Star Trek Enterprise First Flight Blue Jacket is also one of them. A suitable cotton jacket that can be worn at any kind of gathering. Captain Jonathan Archer jacket is finished with cotton fabric. A fabric that will never let you down. Inside it has a viscose lining which bounces them more luxury in wearing. Generally, it is with the suitable length and full sleeve. It has zip end front, short length standing collar that looks more attractive. Moreover, this Captain Jonathan Archer jacket looks more unique due to patches of Star fleet logo. Star Trek Discovery Blue Uniform Leather Jacket is also one of the most favorite jackets of this movie. This jacket is made up of PU leather. It has viscose lining inside the jacket for comfort. It has stood up collar with open hem cuffs and zip closure. Don’t miss this Star Trek Discovery Blue Uniform Leather Jackets it's in blue color and it has the ability to catch the attraction of people.Inside the story of Star Trek, the brash James t. Kirk attempts to live as much as his father's legacy with Mr. Spock preserving him in taking a look at as a vengeful Romulan from the destiny creates black holes to destroy the Federation one planet at a time.Just go to William jackets.com and shop online the Stat Trek collection and don’t miss the Star Trek Beyond Captain James Kirk Chris Pine Blue Uniform JacketandStar Trek Beyond Scotty Simon Pegg Leather Jacket.